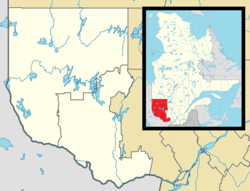 Fort Coulonge is a village in the Pontiac Regional County Municipality in western Quebec, Canada. Its population in 2006 was 1,600. It is also the francophone centre of the otherwise largely (57%) anglophone Pontiac MRC, with 79.6 per cent listing French as their mother tongue in the Canada 2006 Census. Fort-Coulonge is known for the Félix-Gabriel-Marchand Bridge which is actually in neighbouring Mansfield-et-Pontefract. Historic locations of Fort Coulonge. In the late 17th century the site was occupied, perhaps intermittently, by members of the d'Ailleboust family, who used "sieur de Coulonge" as a title. Accounts differ: the Commission de toponymie du Québec mentions Nicholas d'Ailleboust de Manthet, who wintered in that location in 1694; Elizabeth Browne Losey says it was founded by the d'Ailleboust family 'as early as 1650'. With the fall of New France it was abandoned. Before 1800 it was re-occupied by the North West Company, who gave it its present name. When the Hudson's Bay Company took over in 1821 it continued to be supplied from Montreal. Until 1828 it was the head post on the Ottawa River. The post engaged in farming as well as trading. After 1830, as the area became more settled, it became more like a general store. The post's 655-acre (2.65 km2) farm was sold in 1844. In 1855 the surviving store was sold to Thomas Taylor, its last clerk. The buildings were still standing in 1873 but by 1892 they had burned down. The trading post became the village of Fort-Coulonge situated several kilometres down river. The region's first sawmill was built by George Bryson, Sr., in 1843. The first wooden chapel was built in 1873. It was destroyed by fire and replaced by a brick church in 1884. In 1886, the railway reached Fort-Coulonge. Fort-Coulonge became a municipality in 1888 and John Bryson was the first mayor. Esprit Lodge - white water rafting training and certification. ^ a b "Fort-Coulonge". Répertoire des municipalités (in French). Ministère des Affaires municipales, des Régions et de l'Occupation du territoire. Retrieved 2012-04-02. ^ a b c "2011 Community Profiles". 2011 Canadian Census. Statistics Canada. July 5, 2013. Retrieved 2014-01-28. ^ "2006 Community Profiles". 2006 Canadian Census. Statistics Canada. March 30, 2011. Retrieved 2013-05-12. ^ a b Elizabeth Browne Losey, "Let Them be Remembered:The Story of the Fur Trade Forts", 1999. Wikimedia Commons has media related to Fort-Coulonge.